Nigerian Breweries Plc recently inaugurated an ultra-modern block of classrooms, library and toilet facilities at the Special Education Centre for Exceptional Children in Uyo, Akwa lbom State. The ceremony was in honour of Mr. Imoh Essien, the 2016 Maltina Teacher of the Year who is from the school. Speaking at the ceremony, the managing director, Mr. Johan Doyer, who was represented by Mr. Kufre Ekanem, the corporate affairs adviser, explained that the idea of the school-based project was to ensure that when a teacher wins, his community also benefits. Doyer explained that the Maltina Teacher of the Year initiative was hinged on a realization that teachers hardly get the recognition they deserve in spite of the pivotal role they play in the development of the sector. “We set out with an aspiration to recognize, celebrate and embolden teachers. So far, the Maltina Teacher of the Year initiative has produced 42 state champions and two overall winners selected by an independent panel of judges,” he stated. The school project was part of the prize for the winner of the 2016 Maltina Teacher of the Year. Essien, who beat nine other finalists to the coveted prize last year, also got one million naira cash prize, an oversea training; plus, another one million Naira to be paid to him annually for five years. Doyer also expressed gratitude to the Federal Ministry of Education and other stakeholders for the support and partnership with the company since the commencement of the Maltina Teacher of the Year initiative. The governor, who was represented by the Commissioner for Education, Paul Udofia congratulated Essien for making the state proud and lauded the company for the worthy initiative aimed at celebrating exceptional teachers in the country. 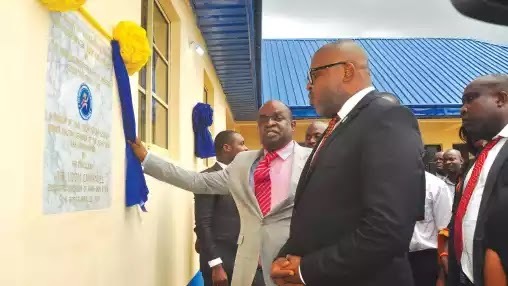 Essien while expressing appreciation to the company said it takes commitment to appreciate the great sacrifice and contribution of teachers to the development of the nation. He enjoined his fellow teachers all over the country to rededicate themselves to the profession and deepen their passion for their calling. The Maltina Teacher of the Year is an initiative of the Nigerian Breweries/ Felix Ohiwerei Education Trust Fund. The fund was established in 1994 with a takeoff capital of N100m, to enable the company play a more active role in the development of education in the country.